You don't need us to tell you when you need new workwear, but when it's time for some new men's bottoms, check out these Wrangler Workwear Men's Black WP82BK Utility Work Pants. Say so long to a poor fit, worn fabric, broken belt loops, and ripped out pockets and s ... (see full details) (see specifications) #WP82BK. You don't need us to tell you when you need new workwear, but when it's time for some new men's bottoms, check out these Wrangler Workwear Men's Black WP82BK Utility Work Pants. Say so long to a poor fit, worn fabric, broken belt loops, and ripped out pockets and say hello to professional work pants that deliver comfort, durability, and style. Slide into these hardworking trousers and get ready for a change. They're constructed in a tough canvas weave in a 7.5-ounce blend of 60% cotton and 40% polyester. Natural cotton feels soft against your skin, and polyester adds durability. These workhorse men's bottoms are finished for color-retention, soil release, and wrinkle resistance, so you can count on them for good looks and easy care. They can be washed in an industrial wash, light soil, and can also be laundered at home. Are they tough? You bet. They're constructed using double-needle stitching and double-reinforced knees. In addition, the front pockets are reinforced, so they'll stand up to use. For convenience, these pants feature 13-inch deep front slacks-style front pockets, delivering a professional look plus functionality. There are two set-in hip pockets with a button on the left. The right leg features a longer, wider cell phone pocket for easy access. These men’s wrinkle-resistant slacks have wider, longer belt loops that fit most work belts, and there's a utility hook on the waistband. You understand the importance of having the right tools for the job, and the same goes for utility workwear. When it comes to professional work pants, buy these Wrangler Workwear Men's Black WP82BK Utility Work Pants. Order them today at Working Person's Store! I have ordered 3 pairs of boots from your online store and is in the construction business and is always purchasing boots and work clothes. Because of your ability to help the customer I will always order my work gear from your company and will highly recommend your store to my coworkers and friends. 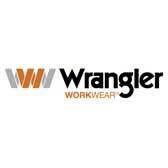 Wrangler Workwear Pants: Men’s Black WP82BK Utility Work Pants is being added to your cart.